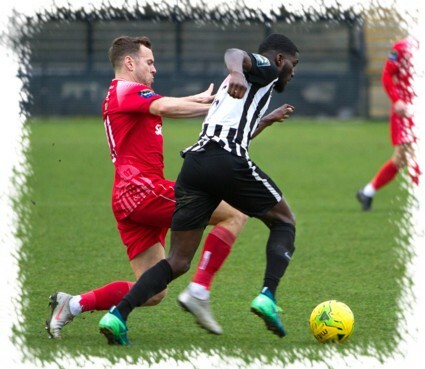 Paul Hughes' table toppers maintained their winning run with a hard working 3-1 win away at Tooting & Mitcham United on a cold Saturday afternoon in January. 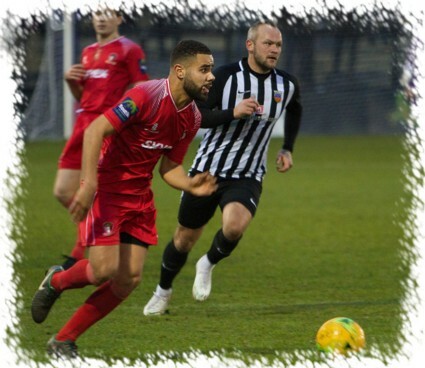 United made a single enforced change to Tuesday's winning side with Rylan Myers coming in for Ola Olajubu who was delayed on his way to the ground and therefore took a place on the bench. With the wind in their favour, it was the home side who started quickest creating two openings in the first ten minutes. A free-kick played into the United box fell to Stefan Ilic, his initial shot was blocked out to Eddie Dines who was marginally wide with a volley from 20 yards. Minutes later the United defence were tested once more, Liam McDevitt part cleared a free-kick but only as far as Dominic Morgan-Griffiths who saw his sweetly hit volley blocked wide by a flying McDevitt challenge with Charlie Burns easily catching the resultant corner kick. Twenty minutes had elapsed when United first got a real look at the Terrors goal. Scott Donnelly slid the ball right to Rylan Myers, the wing-back's first time centre being met on the volley by the arriving Elliot Benyon but the effort was just too high. Just two minutes later and United were awarded a somewhat soft penalty. Donnelly and Benyon combined to get the ball to top scorer Lee Barney inside the Terrors box, the striker being knocked to the ground by Jordan Wilson with referee Higgs pointing immediately to the spot. Donnelly stepped up and coolly sent Terrors 'keeper Luke Colquhoun the wrong way to give United the lead (above). A thirty yard free-kick from home skipper Peter Wedgeworth just cleared Burns' crossbar and a quick switch to the other end saw Donnelly send Toby Little away on the left, his low centre evaded Colquhoun with Benyon sliding in at the far post with the final touch coming from an excellent defensive challenge only for a goal-kick to be awarded. Just three minutes later United did have a second. Benyon won possession midway inside the Terrors half of the field, the loose ball ran to Barney who played it wide to Little, he cut inside and shot with his weaker right, a small deflection off of Antonio Simeone wrong footing Colquhoun as the ball ended nestling in the bottom corner of the Tooting net. The home side closed out the final seven minutes with a goal and a free-kick that was kept out by Burns. On 38 minutes a Donnelly challenge in his own area was adjudged to be a foul despite the United skipper appearing to toe away the ball, and another penalty was awarded, this time to the home side. Daryl Coleman stepped up and despite Burns guessing correctly the kick was too well struck and the home side were back in the hunt. The final chance came in stoppage time with the last kick of the game, Wedgeworth's free-kick from an angle being kept out by Burns and United went in a goal ahead at the break. The second period was to see much less goalmouth action with defences definitely on top, United did however add a third just four minutes after the re-start, again courtesy of a somewhat soft penalty, the third awarded in the game by referee Higgs. The incident that lead to the referee pointing to the spot saw a Donnelly corner loop into the air, Bridges appeared to be nudged in the back by Dines while trying to collect the dropping ball and after a moments deliberation a penalty kick was awarded. Donnelly again took the ball, this time Colquhoun guessed correctly but as with the Terrors kick earlier, the ball was too well struck and United led 3-1. On 53 minutes the ball broke to Barney on the halfway line, he raced to the edge of the Terrors box before firing a goalbound shot that Colquhoun did well to block away with his feet. Just past the hour mark an audacious effort by Bridges from his own half only just cleared Colquhoun's goal and less than ten minutes later the only real effort from the home side saw a 25 yard drive from Coleman go wide of the United goal. 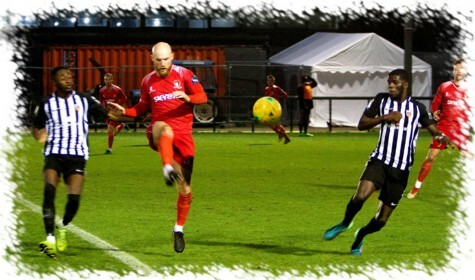 The final twenty minutes of the game was played out with little or no incident in front of goal and the final whistle blew on a seventh consecutive league win for United which maintains the five point clearance at the summit of the Bostik South Central Division. United Man of the Match: Liam McDevitt.